At Penford High School, Britney Taylor is queen bee. She dates whomever she likes, rules over her inner circle of friends like Genghis Khan, and can ruin anyone’s life as easily as snapping her perfectly manicured fingers. Just ask the unfortunate few who have crossed her. For April Bowers, Britney is also the answer to her prayers. With zero friends and nothing close to a boyfriend, April is so unpopular, kids don’t know she exists. That is, until Britney notices her. One lunch spent at Britney’s table, and April is basking in the glow of popularity. But Britney’s friendship comes with a price tag. The Lipstick Laws is one of those books that is good to read when you have been too immersed in out-of-this-world books, particularly ones full of magic or suspense or people chasing other people to kill them. This is the kind of book that you’d want to read to get back to reality, to remind you that real life could also be as exciting (and sometimes, as terrifying) as fantasy ones. I picked up The Lipstick Laws as a palate cleanser after reading books about witches and warlocks and zombies. Even if I have been reading a few contemporaries in between the fantasy ones, I felt like my brain needed something easier, something with less mystery and emotional baggage than the ones I have read recently. I’d gladly read a book that would discuss shallow things like make-up and acne-pills to give me a dose of reality. April is practically invisible in school, until she gets paired with popular Britney Taylor, who accepts her into her circle of friends. Even if Britney was a horrific friend, April could not resist the lure of popularity, especially if it would make her new crush, Matt Brentwood, notice her. Before she knows it, she takes The Lipstick Oath, and it sends her life spiraling out of control because of the silly rules and the price of Britney Taylor’s friendship. I have never watched Mean Girls movie in full, but this book reminds me of that. Britney was absolutely horrible and shallow and it’s easy to dislike her for her stuck up attitude, at least until the author reveals why Britney changed and what she had to live with. This gives Britney more dimension as a villain in April’s life, even if it doesn’t excuse her attitude. April, on the other hand, can get a bit frustrating at times because it took her so long to realize what she was in danger of turning into something she was trying to destroy. While her epiphany on how she was acting didn’t make heavenly light shine upon her but instead felt more like a light bulb moment, it felt like a natural realization for someone April’s age to think as she assess her situation. I like how the author gave the heroine and the villain unique voices and yet still manage to juxtapose their lives for us readers to see how similar they can be. 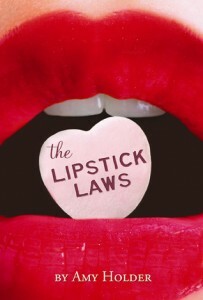 The Lipstick Laws will be out on April 2011 from Houghton Mifflin Harcourt. Much thanks to NetGalley for the advanced reading copy ebook!